Currently living in Japan, Will Long takes hold of each on-coming second and handles them individually with the care of a maker, a craftsman.. a mortal creator. Don’t plan on it. Celer’s ambience remains in a constant motion despite the minimal nature of the two pieces gracing the album, and Will Long’s prolific rate and output of music doesn’t seem to limit him in scope or result in a decreased level of quality, as he is seemingly capable of releasing freshly-scented ambient flavours with every new musical endeavour and without any sign of risk. Lightness & Irresponsibility is possibly one of Celer’s quietest releases. It is also a stand-out in terms of utterly gorgeous texture, only just rising above a hush on the breeze and straying close to the ground without ever displaying a desire to go higher; it’s fine where it is. Will Long’s ambience is now completely refined, perhaps more clearly and deliberately than any other release in his past, and he continues to display a complete understanding of the drone and its artistry. It is clear that Long is an artist with not only the experience and the maturity to effectively calm, nurture and slowly soak his ambient textures; he also has the feel of ambient music down, in that he never demands attention. There is a level of care in the music that reveals a love for the style, and of ambient textural development. The music remains introverted and shy, and yet still captures the heart. Because I forgot to do my late night ambient review last night, here’s some emergency 2012 Celer. This is actually another brand new Celer release, dropped on the 22nd June. It was so new, in fact, that I had to make its own profile on Rate Your Music. I must say I was rather confused initially when I didnt see it there, before I checked the release date on his Bandcamp. You can listen for free on Bandcamp, as well as purchase as a Limited Edition cassette. It’s slightly alarming to think that Lightness and Irresponsibility is Celer’s 8th album release this year; there are thousands of artists who wont release 8 albums over their entire career. Celer produces music at a terrifying rate, far too fast for anyone to even hope to keep up with. You’d have to be a serious fan to have listened to all 60+ albums they’ve release over the last 6 years. Luckily, most of his/their work is of a similar level of quality, so it is possible to dip in almost anywhere and start listening. The other 2012 Celer album I reviewed was Evaporate and Wonder, a deliciously delicate, heartbreakingly beautiful release, filled with 40 minutes of shimmering, careful drones. This album is very much in the same vein if not, dare I say it, even quieter. My house in the day isn’t a terribly noisy place (at times), but I’m having to turn my volume slider to maximum to really hear it. Updating the ReplayGain in Foobar is helping give it some extra welly. “An Unforced Cheerfulness” has already been playing for 18 of its 20 minutes, and I have no idea what I’ve done with that time. It has slowly been building for its entire duration; a sad, thoughtful sound, with brighter drone sequences weaving and unravelling as a deeper, darker, bassier drone begins to emerge in the latter half. It’s a curious piece, unfolding out of air very slowly, its wistful tones bearing an ounce of optimism, a wry smile behind an otherwise unhappy face. “Involuntary Impromptu” is a different animal; a deep sub-bass permeates the core of this piece, breaking the surface every so often with a rumbling roar. Airy drone fragments dance and float around the cresting bass before growing more isolated and just hanging in the foreground until they’ve run their course. There’s a great deal more activity here, and it’s not submissive either. The bassier, almost orchestral pulses, are big, bold and determined inclusions that mirror the “impromptu” thought process that went into creating them. Once again, titles and names tell as much of a story as the music itself; there is a childlike innocence and contentedness here, it feels like a burden has been shed and life has gotten more carefree. There is a tinge of sadness in the first track but there’s also an unselfish happiness, followed by a bigger, bolder track than before as our responsibilities are jettisoned and life gets more spontaneous as the world and its possibilities open up before us. It’s quite a protracted way of saying that even though things may look bad in your world right now, the load will eventually lighten, and when it does you’re allowed to be happy and do things that you want to do. Celer aka Will Long is a prolific producer with several albums, collaborations and EP’s on his CV. 2012 is no different and sees a multitude of his releases coming to fruition on various labels in multiple forms and editions. It is all the more wonderful that his releases never seem to be rushed or impatiently thrown at his fanbase. Lightness And Irresponsibility continues this tradition and is actually his strongest solo work of 2012 due its bold connection to Japanese culture and art. Usually residing in Huntington Beach, California, Celer is for now a citizen of Tokyo. With great beauty comes great responsibility, and Long is keen on soaking the minimalistic traits of the Japanese Ambient scene in: with only two tracks on this album, both with a duration of over 20 minutes, he favors compositional skills over synth tweaking. This fact is referenced implicitly in both compositions that are very similar to each other and are based on identical textures and layers. The surprise level in this regard is low, but Lightness And Irresponsibility doesn’t want to be consumed this way anyhow, for tranquility and reflective peacefulness are the superior goals that are encapsulated in every drone layer and alcove of it. Both tracks were recorded in Tokyo in March 2012 and given their cover artwork by Rutger Zuydervelt aka Machinefabriek, a frequent collaborator with Celer. It is released on the Constellation Tatsu cassette label. However, the album is also available in digital form in many digital music stores. Can one really write an in-depth review of two supposedly overly similar tracks? One can indeed, especially since this Drone gem delivers big time if you’re a fan of Japanese Ambient music and embrace calm, entrancing arrangements. An Unforced Cheerfulness is, first things first, an auspicious and greatly chosen track title. It describes the best possible way of living in modern times, I suppose, and with these thoughts in mind, I approached this 20+ minutes long composition, hoping to find an intense aura that is at the same time laid back and convivial. And in a way, this is exactly what’s presented throughout the duration, but thankfully, the feelings of tranquility, peacefulness and solemnity are much more in the limelight than any cheap wave of euphoria. An Unforced Cheerfulness fades in slowly and in a balmy manner, with gracefully meandering water-soaked morning dew synth layers that are both ecclesial and warm. Soft bass drones add plasticity and depth to the gleaming atmosphere, and there are slightly, almost inaudible cherubic traits to be found in the moiré of intimate majesty. Upswell and downfall of the layers are carefully placed, as if not to disturb the fragile flow. The textures themselves are neither hazy nor thick, but inherit the humble iridescence that is so typical for artists who reside in Japan or are of Japanese origin. The compositions of Drone and Ambient artists like Tetsu Inoue, Masayuki Taguchi or Pass Into Silence come to mind who create a similar, purposefully reduced mixture of gently wafting gusts only to increase the pompousness at the right moments, and then only with the greatest care. Celer’s first track uses the same stylistic trick and is yet different, even scarily so: while the first five minutes depict a forlorn mystique or melancholic mist, scarcely cacophonous layers are introduced shortly before the sixth minute that create tension and uncertainty; as it is the supposed norm of Drone tracks written in Japan, these slight mood shifts – or enhancements – aren’t pushed to the foreground. They are suddenly kind of there, but were unnoticed before thanks to their subtle nuances. Be it as it may, the matrix of An Unforced Cheerfulness opens up, expands and widens the mood range from the aforementioned sixth minute onwards. The formerly morning-evoking layers are now played in minor at times, suggesting an approaching uneasiness and dangerous figments. As I’ve implied in the previous paragraph, I’m talking about audible, easily perceptible adjustements in tonality. The overarching mood is maintained and doesn’t change, and even the bass drones that are more prominent around the ten-minute mark don’t bring baneful foreshadowing visions with them. The last third of the track sees a decrease of the tone shifts in minor, as the point of departure is now reached again, with warmer undertones that try to mediate between sadness and happiness, before the song fades out slowly. An Unforced Cheerfulness thus provides a twofoldly reduced setting: firstly, all ingredients and synth-related parts are already introduced right from the get-go. It’s only a few nuances and tiny shifts that are adjusted, but otherwise, no cheap thrills or unexpected surprises detract from the mood. Secondly, the mood itself is maintained throughout the track. It is true that it starts with contentment and moves into gloomier territories in its middle section, but don’t expect a clear-cut progression or marker. The shift just happens and makes room for a reprise of the titular unforced cheerfulness in the last third. Despite the runtime of 20 minutes, it’s a minimal track that encapsulates warmth and gleaming beauty as well as doleful memories, but both moods aren’t presented in an explanatory manner. Like an almost imperceptible breeze, they float around and merge with opposite moods and wind directions. It’s a beautiful Japanese track for skilled Ambient listeners. “Not much is going on,” as one of the most despised sentences of a reviewer’s repository tells you oftentimes. I’m stating the same. But behind the curtain lies the true beauty of An Unforced Cheerfulness. Peek behind it, and you’ll receive a treat. The second composition with a runtime of 22+ minutes is called Involuntary Impromptu. Again, the human will is implicitly referenced in the title. The tonal characteristic traits of this second track are undoubtedly very similar to An Unforced Cheerfulness, but due to a certain feature, Involuntary Impromptu could well be the more attractive alteration: this second track is all about a good dose of happiness and an eupeptic outlook. As expected, these moods aren’t depicted via synth (out)bursts or particularly memorable hooks, no, it is once again all about the slow build-up. Right from the start, the same gleaming, misty morning-like synth waves wash over the listener, but they seem to shimmer in golden colors as if they bathed in sunlight. Warmth and contentment are more prominent, and the droning bass accompaniments are a further source of thermal heat. Of great success are once again the undertones one might miss: the pulsating and occasionally piercing drone layers which swirl around the main synth lines glitter and glow despite their fragility and thin nature, and it is during the eighth minute that they are allowed to shine, as all other elements are faded out for a short moment. The atmosphere is gelid, almost glacial, but since the bass drones are coming back soon enough and the mood is so majestically humble – an oxymoron I’m using reasonably, I hope – and enchanting, this short moment of minimalism cannot be perceived as a stylistic break. In the last third, the bass drones are revved up and much more prominent, but never in the foreground. It is here that for short moments, the already known oscillation between shelter and danger-evoking gradual tone shifts occurs exactly three times, but it is by no means bold enough to deny Involuntary Impromptu its colorful aura of blithesomeness. As the song fades out slowly, a luxurious amount of calm and reflection is reached. Lightness And Irresponsibility is a terrific release that mentions the programmatic mood shifts in its title already. Despite the warmth, insightful tranquility and maintained aura, this Japanese gemstone is only for the strong-minded Ambient listeners. Both tracks are very similar to each other. Over the timespan of 20 minutes, not much seems to change, there are no additional tricks to be found anywhere. One has to be patient. This is not the first time I’m making these remarks, for the albums by Thom Brennan, of which I’ve recently reviewed Mist (2000) and Vibrant Water (2001), may stylistically be far away from Celer’s music due to their opulent, luxurious wealth of synth layers, but still somewhat related in their depiction of focus. Impatient listeners won’t spot the tiny differences in-between the fissures of each track and might be bewildered about this fact. Will Long’s Lightness And Irresponsibility paints an entirely different scenario, but with the same deliberate process of reduction: no additional synthesizers or ornaments are introduced, the only shifts that occur refer to the context of the mood. It’s a composition-driven album, whereas many an Ambient album also relies on a mélange of changing styles and instrumental tweaks. Celer doesn’t succumb to the endless possibilities found in the realms of electronic music and delivers a wonderful, narrowly pinpointed Ambient album that offers plenty of microscopic curlicues for skilled Ambient listeners to unveil and observe. I’m always shying away from denying a listener his or her ability or skill of understanding or appreciating a work of art. It’s an affront, a cheap ad hominem attack, especially when it comes from a reviewer. However, I’m really trying to stress that the wide range of Ambient music styles isn’t always easily accessible. 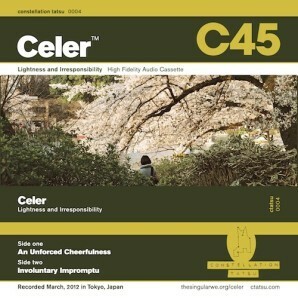 Celer’s Lightness And Irresponsibility sits on the melodious side of the spectrum, but its track durations and utter focus on peacefulness and reflective thoughts – both Japanese virtues – might put Pop Ambient fans and synth lovers off, hence my admittedly audacious reference to one’s skill. If you’re a fan of Japanese Ambient music, though, this is a no-brainer, not the least bit clichéd and hence highly recommended. Celer is the craftsman behind Lightness and Irresponsibility, the fourth of four tapes sent to me by the good folks at Constellation Tatsu. This cassette is more fun, at least in presentation, than the Long Distance Poison release. The music is not that different however. MORE. DRONE. Good stuff, but I’ve done tripped the light fantastic all afternoon, what else can I find out in the ether? CT is a label of high quality and I definitely appreciate the production of the music as much as the pro-design of the tapes. Just buy any and all tapes from these California freaks if far out spins the juice, you gotta drink. If names were reflective of personality traits, would the world be a better place? Shakespeare argued the idea, but it’d be nice to have some advanced warning system when dealing with a person or institution. It’s the beauty of Lightness and Irresponsibility, another beauty from Celer. It dares not tread in any territory not in line with the album’s on-point focus, two long-form meditations rarely raising their voice. There is no discipline or consequence to these compositions, just a life at its most carefree. As douchebag CEOs rig the stock market and two-faced politicians further divide America for ill-gotten gains, it’s comforting to forget the sadness surrounding Celer and focus on those lighthearted moments of youth. It’s not nostalgia but a moment in time frozen, forever providing the calm center we need in a world of mislabeled sycophants. I love it when album artwork perfectly illustrates its sound. Recently I was struck by how well the humble photograph of a woman’s back among flowering trees described Lightness and Irresponsibility by Celer. The cover reminds me of the work of one of my favorite painters, Caspar David Friedrich, whose works frequently feature the backs of a small figures or figures looking out onto a vast landscape. When viewing these paintings the audience gets a glimpse into the contemplative experience of the subject. Similarly, when I listen to this two song cassette/digital album I feel like I am also participating in a shared contemplative experience. Like Friedrich, Celer’s Will Long has composed an expansive landscape. This is not the dramatic landscape of shipwrecks and polar expeditions (as in Freidrich’s “Sea of Ice” from 1823) but rather, this is one of soft edges and seemingly infinite vistas (as with the classic “Wanderer above the Sea of Fog” from 1818). While Friedrich may celebrate exotic locations in his paintings, I believe the Celer album is perfect for being where you are. By that I mean that this is the kind of album that encourages stillness. The great Constellation Tatsu label put out this tape in 2012 consisting of two long drones titled, “An Unforced Cheerfulness” and “Involuntary Impromptu.” Both sides unfold gradually and with exceptional restraint. There are subtle, almost imperceptible overlays of warm tones and low bass-filled hums washing back and forth from ear to ear. If you’re looking for music to accompany horizon-gazing – you’ve found it. Tener dietro alle decine di produzioni pubblicate ogni anni da Will Thomas Long sotto l’ormai solitario alias Celer è operazione praticamente impossibile, riservata quasi esclusivamente ai cultori della sua ambient music raffinata e ricca di dettagli emozionali. L’enorme mole di uscite, lungi dall’essere indice di uno scarso filtro tra le proprie creazioni (e ancor meno di velleità “commerciali”), risponde invece alla naturalezza con la quale l’artista americano traduce in musica i moti del suo animo. Si prendano ad esempio i due brani di oltre venti minuti l’uno compresi nella cassetta a edizione limitata “Lightness And Irresponsibility”: due composizioni placide e minimali, costruite attraverso cospicue elongazioni di note, modulate in maniera tale da creare un fluire amniotico uniforme e rasserenante. Eppure, a un ascolto attento, i suoni delle due lunghe composizioni evolvono gradualmente, traducendo la leggerezza di cui al titolo in limpida persistenza, ideale accompagnamento a serene decompressioni ipnotiche, ma anche a concentrati ascolti alla ricerca dei movimenti di toni e frequenze basse. I started out with the only name I seem to have recognized, which is Celer, and Will Long plays two pieces of music here that are text book Celer. Two long, sustaining pieces of deep ambient music, long form drones. Its great, its fine and its what we know. I am not sure why I picked that one to play first, as perhaps I already knew this was coming. Mind you, I am not negative here. If this is what the fans wants, this is what the fans get, I suppose. Celer is a master, and this is no different from many of his previous works. C’est ca.